It is with a frequent occurrence that we end up reviewing slots that possess a Chinese theme or even a Japanese theme. However, it is rare that we venture slightly west and hit the themes relating to Thailand and the surround region. Luckily, pioneering slots developer WMS Gaming has sorted that by launching this Thai Flower slot. 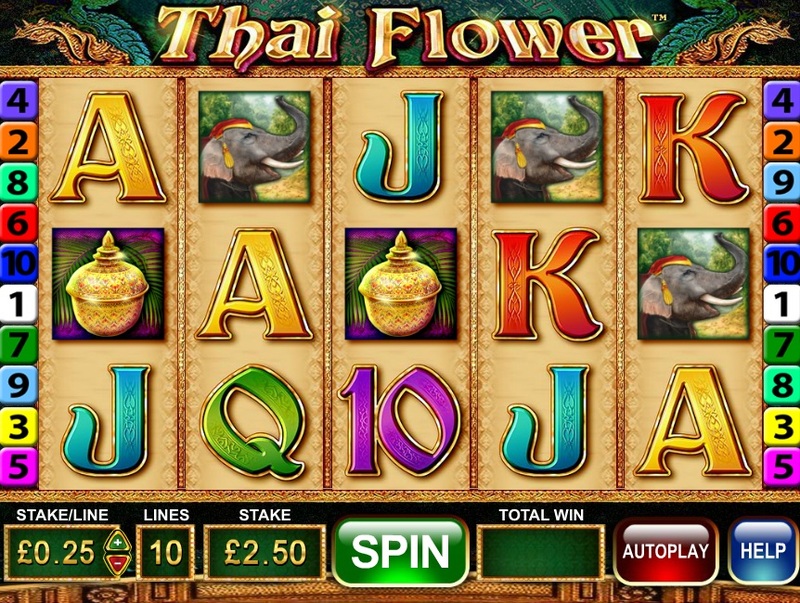 Thai Flower is a 5 reel, 10 payline slot that focuses on the natural beauty one might care to stumble across if they were to travel Thailand. Judging by the imagery in this slot, it is easy to see why so many people flock to the Asian country for either a gap year or just a short holiday break during the summer. The symbols presented on the reels include a gorgeous Thai lady, a traditional Thai boat, a gold Thai vase, an elephant, a Thai palace, and the regular 10-through-to-Ace symbols that fill up the remaining positions. 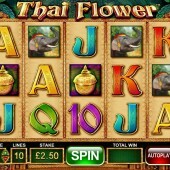 The Thai flower at the centre of this slot is a pink flower that acts the Wild. It has the power to substitute for all symbols across the reels to complete any potential winning combinations that might appear on a single spin. Furthermore, the Thai flower (a pink lotus if my horticultural research is correct!) also represents the game's Scatters. If it appears on reels 1, 3, and 5 simultaneously on a single spin then it will trigger 12 free spins. Once triggered, you will be asked to reveal three random symbols that are hidden behind three enclosed Thai flowers. The symbols revealed when the flower opens up will fill the reels. Yes, you read that correctly. The reels will be full of just three symbols. As you might guess, that can produce some huge wins particularly if you reveal some higher paying symbols. Unfortunately, the Wild cannot appear as one of the symbols. Thai Flower is almost as basic as you can get with a slot. The fact that the Thai flower acts as both the Wild and the Scatter shows that there is not too much depth to this game. The randomly selected three symbols making up the reels on the free spins is a master stroke but they missed a trick by excluding the Wilds. That could really have raised the stakes. Still, it's a different slot to play and is unlike any other WMS Gaming slot I've played. If you want more multipliers and Stacked symbols in your bonus features then you're better off trying either the epic Raging Rhino slot or the legendary Zeus slot.